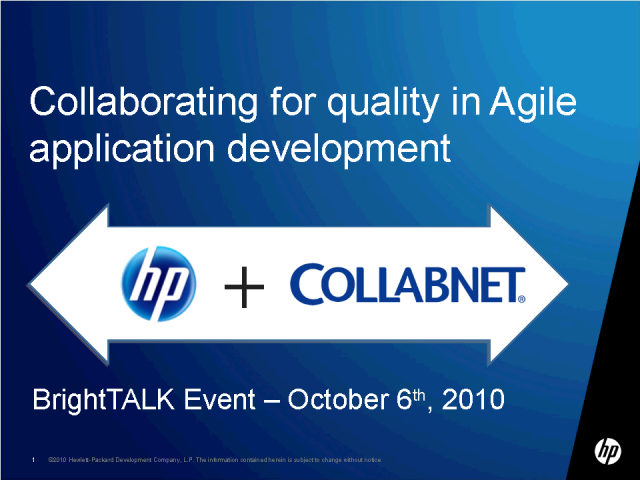 See how the CollabNet to HP Quality Center integration creates a bi-directional synchronization of requirements, development, and test artifacts to meet the demands of frequent releases, continuous build, integration and quality management. This connector enables business analysts, project managers, Agile developers and QA team members, each working exclusively with their tool of choice, to improve visibility, communication and collaboration among teams - and ultimately, the quality of their software projects. Giampiero Saracino, Senior Presales Manager, is currently managing the EMEA Apps Presales Practice in HP Software & Solutions. The practice comprises experts focusing on Functional Assurance, Performance Validation, Application Security Assurance and SOA Testing software products portfolio. Since 1989 he had gained extensive experience in all the different phases of Software Application Development Lifecycle, at project and program management level, ranging from Airspace/Military Real Time applications to Corporate Core Business applications, adopting different development methodologies. He led the Identity and Access Management Practice in HP, looking after EMEA presales activities for Identity, Access, Federation, and Audit Management software products. Roy Woodfine, Senior Technical Consultant is currently managing the deployment of CollabNet solutions throughout several industry sectors within Europe. Roy has led a variety of significant SCM implementations including a CMMI Agile adoption at a leading investment bank that could demonstrate full compliance after only 6 months.